During the summer Shashi and Chakra have been busy painting in Kathmandu, surviving the monsoon. 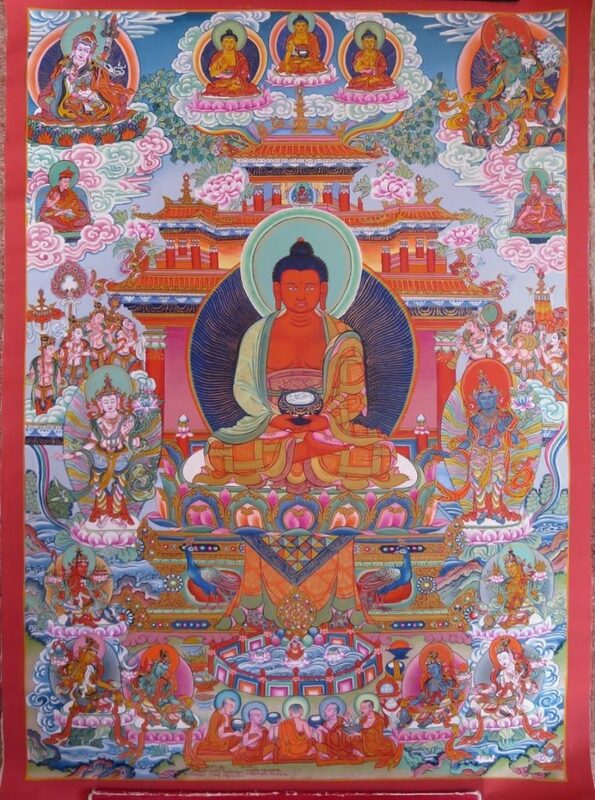 This thangka of Amitabha’s western paradise, Sukhavati (བདེ་བ་ཅན་ཞིང་སྒྲུབ) was commissioned by an overseas collector, but is now available to buy. If you are interested to see more detail or already know that you love it, please get in touch. Having spent many months on it, the brothers are keen to send it to a good home. This is a unique opportunity to have some of Shashi’s art to gaze at every day! 22×31″ on Shashi and Chakra’s handmade canvas – cow glue and stone white layers applied to cotton. The colours are stone pigments from Tibet, China and Japan painted in the སྨན་བྲིས་ (men di) style. The mantras for each deity have been painted on the back, endowing the thangka with their presence.